Veronica Tang currently attends Harvard College in Cambridge, Massachusetts. Her interest in STEM was sparked in 6th grade, when she volunteered at an event to teach autistic children circuitry with breadboards. Subsequently, she began immersing herself in competitive math and participated in a robotics summer program that furthered her interest in STEM. In 2014, Veronica began volunteering for the International Fringe Festival and became the Assistant Box Office Manager for the San Diego Fringe. Later, she designed and developed a multi-show pass management subsystem by integrating Selenium Webdriver, Python, and Java to improve the efficiency and security of ticket sales. Her system was also adopted by the Charm City Fringe of Baltimore, Maryland. Meanwhile, dedicating hundreds of hours each year to All Girls STEM Society (AGSS) since 2015, Veronica recruited over 100 student volunteers from 21 schools, developed the leadership team, recruited an advisory board, and managed the logistical aspects of various all-girls activities and many community outreach events. Her passion lies in applying technologies to make a positive impact on the larger community. In particular, she feels her work for All Girls STEM Society has given her the power to empower other aspiring girls. In her spare time, Veronica loves creative writing and watching anime. Eleni Fafoutis recently relocated (December 2015) to Virginia Beach, Virginia, and has successfully re - founded and revitalized a new chapter of the All Girls STEM Society in Hampton Roads, which has a strong focus on serving underprivileged students. Eleni attends the University of Virginia in Charlottesville, Virginia. Eleni is a two - time TARC (Team America rocketry challenge) national finalist and and member of NAR (National Association of Rocketry) and AIAA OC Rocketry, and recipient of the 1st place overall SPARC (student payload and rocketry challenge) award (2015). 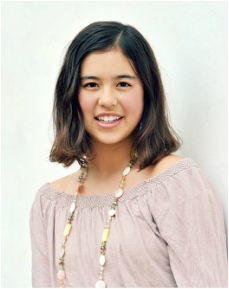 She has attended the California State Science Fair twice and is the recipient of awards from the Office of Naval Research, the Air Force, American Vacuum Society, and 2nd place in the Physics / Astronomy Senior division. She currently is on Varsity women's crew (rowing), and is President of Debate on her Forensics team, as well as President of the National Honors Society, Meehan Chapter. Eleni was accepted this past summer into UVA's prestigious Sorensen Institute for High School Leaders Program. Eleni has also been awarded second place in the Eli Wiesel Holocaust writing competition and has interned for the past two years at Horizons Hampton Roads, working with underprivileged students and teaching 3D printing. Eleni is the founder of the SMCHS Rocket Club and the president of the BSCHS Rocket Club. She loves watching the Big Bang Theory, designing and playing her own computer games, reading, listening to country music, and playing water polo. In the future, she hopes to pursue a career in medicine, potentially in neuroscience or biomedical engineering.